Where do you see the future? Increasing digitalization, demanding customers, falling interest rates, legal regulations, branch closures - the financial world is in a state of flux. Nobody knows exactly what the future holds. The evo series from KEBA is your essential module for the future - whenever this begins and whatever it looks like. 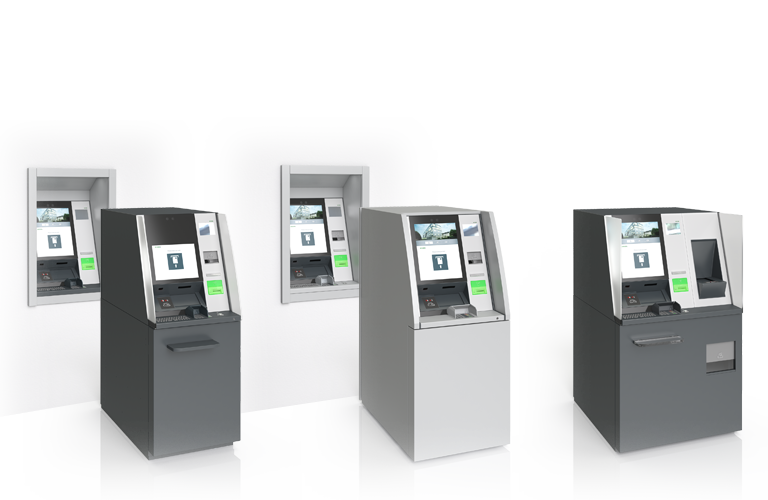 Whether it's an innovative ATM with cash recycling function, multi-functional self-service system, automated services or the unique merging of self-service system and communication platform: The variety of performance and possibilities of the evo series make you flexible for the demands of the future. Precisely because your world is becoming increasingly dynamic, we do not want to drastically change everything that was there before with the (r)evolutionary evo series. KePlus R6se and KePlus X6se have already made an impression with their maximum availability. evo is therefore more of a slow, steady development in which many small changes are harmoniously assembled into a whole together with that which already exists. We rely on stability and things which have proved themselves in the past - combined with the claim of continuously improving products and therefore achieving a smooth transition to new products with progress at the highest level. This is also why we are again collaborating with our long-term partner Hitachi-Omron Terminal Solutions on the most important technical component - the cash recycling module. Hitachi-Omron Terminal Solutions, world market leader in the field of cash recycling, has been the strategic partner of KEBA since 1992. The partnership is characterized by close cooperation and lively exchange, most recently with the result of a jointly developed cash recycling module for the evo series. KEBA has gone a step further with this development by actively involving selected customers in the development and continually feeding their input back to the KEBA developers and Hitachi-Omron Terminal Solutions. This form of cooperation is also known as "co-creation". Customers are not seen as passive receivers but are incorporated into product development as value creation partners. The results are solutions which are more orientated to the customer needs than ever before. Clarity, structure and organization characterize our feeling of quality. Fulfilling our own quality claim and those of our customers is our top priority. And: we at KEBA are engineers at heart. We therefore deal with complexities with a great love for detail in order to create amazing solutions. For us, this means that our claim of providing premium quality is not only shown in the design of our device, but it penetrates into the innermost core of our systems and every individual component. evo combines technology with passion in the optimized interaction of all technical components, the mechanical system and the overall device with all its usability and design facets. 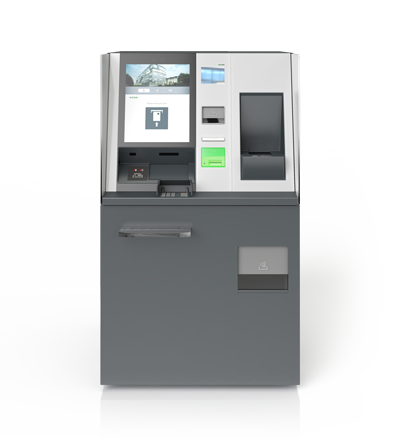 The heart of each product in the evo series is the new UR2A cash recycling module, which was jointly developed with Hitachi-Omron Terminal Solutions. KEBA is the exclusive provider of this technology in Europe. Premium quality, maximum availability and durable, robust technology have been and still are our guiding principles for the further development of the proven HCM (Hitachi Cash Module). We rely on the proven type 5 validator for validation. The cash slot makes a major contribution to availability with its new withdrawal and singling technology. As well as protecting the cash, the all-in-safe concept protects the main banknote-processing elements from external manipulation. The dual cassette technology makes it possible to recycle up to eight denominations. Barely visible technology, ergonomic improvements (tilt, height, visibility, illumination) and weatherproof mechanics now make withdrawals and deposits even easier for all user groups in any environment. The availability of your self-service systems directly effects the usage rate of the self-service area and the economic efficiency of your branch. 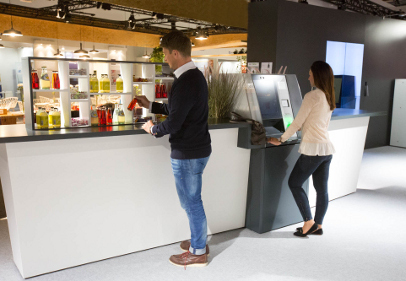 The easier the self-service systems to operate and the shorter the service times, the more transactions will be processed in the self-service area. In addition to the optimized banknote transport inside the device, we have invested a great deal in “usability” in order to make the system even easier to use for bank customers, and to minimize incorrect operation. The SmartSurface, clearly arranged elements and the revolutionary light-assisted user guidance using power LEDs direct the customer’s attention to precisely where activity is required with evo. The availability of your self-service system depends on how quickly problems that occur are remedied. If a fault (for example receipt printer paper runs out) occurs, the bank employee can solve this problem independently and within an extremely short time by using KePlus MAX. Thanks to a simple user interface and graphically supported step-by-step instructions, troubleshooting is easy for the bank employee and thus the number of mistakes is reduced. Your customers are diverse and have different needs - meaning that self-service should be attractive to all of them. Complicated buttons, incomprehensible instructions and confusing interaction fields are unfortunately the norm in many self-service systems - and overtax your customers right from the start. We have therefore set ourselves the following goal at evo: A visually appealing design, ease of use for all of your customers. For us, Design4all means not only complying with standards but making the overall system attractive to use. As banking automation experts, we know that a self-service system should operate over a long period of time without problems. For the new evo series, we therefore rely on glass for the user interface, since it is not only extremely resistant to wear and vandalism, but also very easy to clean. Worn and dirty plastic fronts are therefore a thing of the past. The user interface is the most important interaction point with your customers. Multitouch display, integrated cameras, sensors and a fundamentally new operating and illumination concept make up the "SmartSurface" of evo. 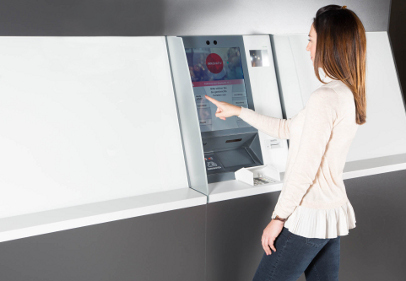 In a unique way, the multitouch screen fulfills the high expectations of modern bank customers who are used to the tablet-like operation of everyday devices. It is often necessary to adapt the branch equipment to the needs of different groups of people, e.g. with regard to accessibility. With the "design4all" approach of the evo series, the diverse requirements of all users (customers, service technicians, device operators etc.) have been taken into consideration in order to exploit all usability potentials. * The future of banking institutions lies in the digitalization of services, but despite this, the digital world should be personal and human. * Efficiency in branch operation is necessary, but not at the cost of your customers. * Customer proximity is an indispensable success factor, but customers are paying fewer and fewer visits to your branch. With evo, we are building a bridge to connect the analog with the digital world. 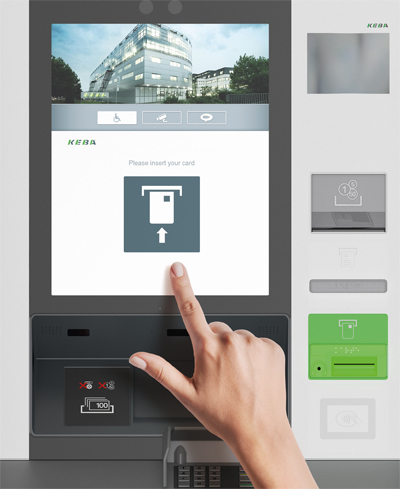 With its integrated design, evo is flexible for any requirements: customized as the brand ambassador for your institution, seamlessly integrated in modern branch architecture, a combination of self-service system and communication platform, or completely independent of the installation location (indoors or outdoors). The possibilities are endless and will fascinate you. With evo, automated banking services can easily be combined with consulting services. 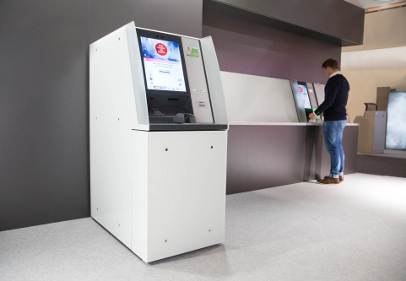 Because of the complete integration of the products of the evo series in new counter solutions, automated services can be provided and personal communication reinforced at the same time. The use of new sales and marketing channels is an important success factor for branch concepts. The ATM is one of your most important customer contact points. 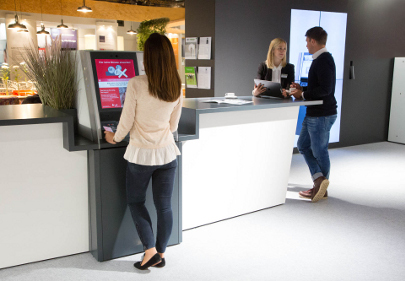 Why not simply use the self-service device for cross-selling and individual customer marketing campaigns? evo's SmartSurface, the 19-inch screen, NFC and bar code scanning facilitate omni-channel banking. Recycling of foreign currencies, large payments, credit and savings transactions, combined with immediate services at the terminal - the scope of your marketing and sales ideas is unlimited with evo. You can implement your individual designand branding directly on the evo system, regardless of the location. The installation and ventilation concept, which is unique on the market, makes enclosures, full-surface paneling, extensions and additions possible. In this way, you make your customers aware of your brand. evo enables a combination of self-service system and counter services, regardless of whether you integrate the system in your counter architecture or wish to provide fully-automated services in extremely small branches. Making future-proof decisions is more important than ever - but is made all the more difficult if the world is becoming increasingly complex, dynamic and unpredictable. It is therefore important to minimize the risk of making investments today which may no longer fulfill the requirements of the market tomorrow. The evo series creates freedom for decision making and investment with which you are always on the safe side regarding the design of your banking solution. 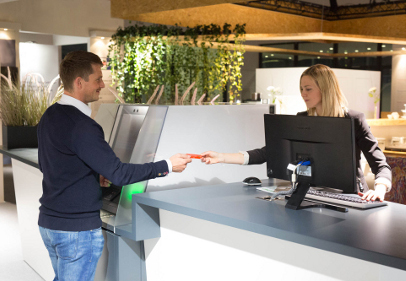 With all the new features, it is just as important for the technology to be versatile and future-proof - in other words, independent of the type of branch, the services and function which are offered, whether it is a counter solution or self-service system, or whether it is in the self-service foyer or outdoors. With the evo series, KEBA provides you with systems, that are suitable for any self-service transformation and fulfill future requirements which are probably still completely unknown at the moment. This is made possible by means of a modular expandable system: New self-service functions can be added at any time using the wing concept, and in such a way that it is not obvious that the function has been added afterwards. The wing is integrated in the entire system and influences acceptance and user-friendliness in the best possible way. Using a well thought-out ventilation concept, evo can also be integrated into counter architecture or designed with paneling elements extremely easily and at any time.